In this rapidly evolving world of technology, the innovative City of Altamonte Springs, Florida, faced a challenge: the software it used to deliver its authoritative spatial data to employees via web apps was quickly becoming outdated. Altamonte Springs needed to find a solution, fast. 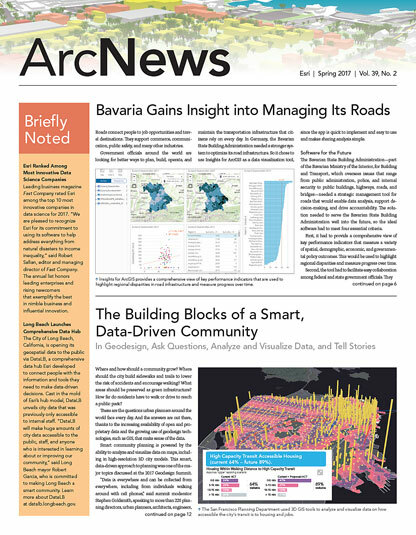 The city’s existing GIS apps were originally built using ArcGIS Viewer for Flex. But Adobe stopped supporting Flex. So Altamonte Springs looked at several potential, non-GIS replacements, but they all had drawbacks, including high costs, increased maintenance, and short-term viability. The city decided instead to leverage its existing ArcGIS Online organizational account and convert its Flex apps to ones built with Web AppBuilder for ArcGIS. With the switch, the City of Altamonte Springs got greater flexibility and functionality in its apps. With apps like Streetlight Inventory, city staff can access valuable information about Altamonte Springs. Changing to Web AppBuilder for ArcGIS—which lets users build native, cross-platform apps without doing any coding—has made it easier for the city to deliver its data to internal users. With its new apps, the city’s GIS division has been able to create more efficient workflows. The department no longer has to worry about updating software on individual computers because Web AppBuilder for ArcGIS is software-as-a-service (SaaS) technology, meaning Esri pushes out updates automatically. When ArcGIS Online gets upgraded, the GIS department automatically has new features at its disposal. Updating the apps themselves has become easier, too, since they are less customized and don’t require any code changes to get the new capabilities to take effect. The apps are also currently kept in one central location. Whereas before, specific apps were built for certain people or departments—and only those users had the links to the apps—now, all the city’s apps are housed in ArcGIS Online and appear on the gallery page. Early on in the transition process, it was decided to gear the ArcGIS gallery and home pages toward internal users. So even though the pages are public, the internal apps—which are secured via ArcGIS Server (now called ArcGIS Enterprise)—can only be accessed by people with city credentials. The home page serves as a landing page for maps and apps, displaying some of the city’s most-used apps, such as the public works, growth management, and address apps. It also provides links to more in-depth overviews of GIS, its history, and the field’s development, as well as a video that shows users how to create custom maps in ArcGIS Online. The City of Altamonte Springs’ GIS division maintains the gallery and home pages and controls which apps are displayed. This makes it easy for the department to add new apps and remove old ones as needed. The City of Altamonte Springs also employs Web AppBuilder for ArcGIS to create web apps for public use. These apps and other downloadable GIS information can be found in separate gallery pages linked from the city’s website. This way, residents and visitors alike can find what they’re looking for—from zoning maps to interactive apps that deal with current and future land-use issues. Two recently published apps, for example, offer members of the public a more interactive way to learn about the City of Altamonte Springs. Park Locator helps users find nearby recreation centers and lists their available amenities and activities, while My Government Services provides information about local resources, such as elected officials, community centers, transportation options, and police and fire stations. By now, the City of Altamonte Springs has converted all its web apps to Web AppBuilder for ArcGIS. And both internal and external users have quickly accepted and adopted the new GIS apps. The Web AppBuilder for ArcGIS apps have an improved user experience compared to the city’s old, Flex-based apps, and the gallery, which displays thumbnails, is easier to use. Additionally, city employees now have access to an array of apps that many of them didn’t know existed. As a result of this successful app conversion, the GIS division is helping city employees understand how the technology can be integrated to improve their existing workflows. This, in turn, lets the city provide more resources that benefit employees and the community. For more information on Altamonte Springs’ new web apps, visit altamonte.org or email Richard Littlefield. Richard Littlefield is the GIS manager at the City of Altamonte Springs, Florida. Olivia DeSimone and Kyle Crawford are GIS analysts at the city.